The map above shows typical transit times for GROUND Shipping. Ground Shipping is FREE on all orders over $100. We can provide Next Day, 2nd Day Air, 3rd Day Select pricing upon request. For example, if you live in Zone 5 and complete your order on Monday before 2:30pm you should receive your order the following Tuesday by the end of the day. Shipping and transit dates and times are NOT guaranteed. Sorry, we have no control over the shipping companies or their activities. We also can’t control the weather which often influences delivery times. Please understand that delays can happen at any time for any reason, and we have no control over those. The above is to help give you an idea of their typical delivery times for GROUND shipping. For best results, plan ahead and order your banner printing well in advance. Cut-off time for orders is 2:30pm Pacific Time. Delivery countdown does not begin until an order is submitted, so for example, orders submitted on Friday at 3pm Pacific won’t start their countdown until Monday (Tuesday if Monday is a holiday). The above days represent Business Days, Monday through Friday except Federal Holidays. Saturday Next-Day delivery is available upon request. Expedited shipping IS available. We can order Next Day, 2nd Day Air, 3rd Day Select and Saturday deliveries. These shipping dates are also NOT guaranteed by the shipping companies. We provide absolutely no guarantees on shipping timelines — only printing timelines. Delivery times are End Of Day (EOD) which the delivery companies typically count as 8PM delivery local time. Morning delivery options are available but not guaranteed. 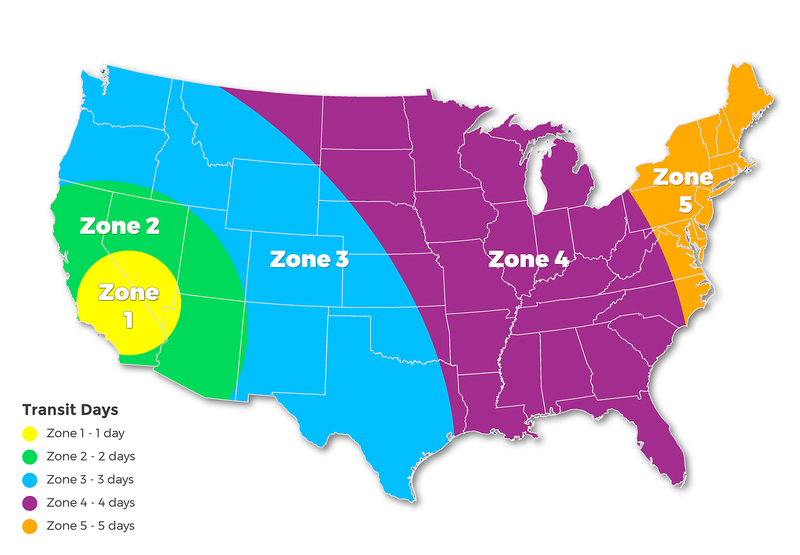 Delivery Zones are approximate. Some areas in the Zones are a day less or more than portrayed on the map.